Thank you Workman Publishing, for sponsoring this post. Pick up your copy of the new fifth edition What To Expect When You’re Expecting anywhere books are sold. Since this is my second pregnancy, I know at least partially what to expect. I have been through it before and have learned a ton along the way. There are things that I want to do the same as during my last pregnancy and some updates to the things that I was doing. 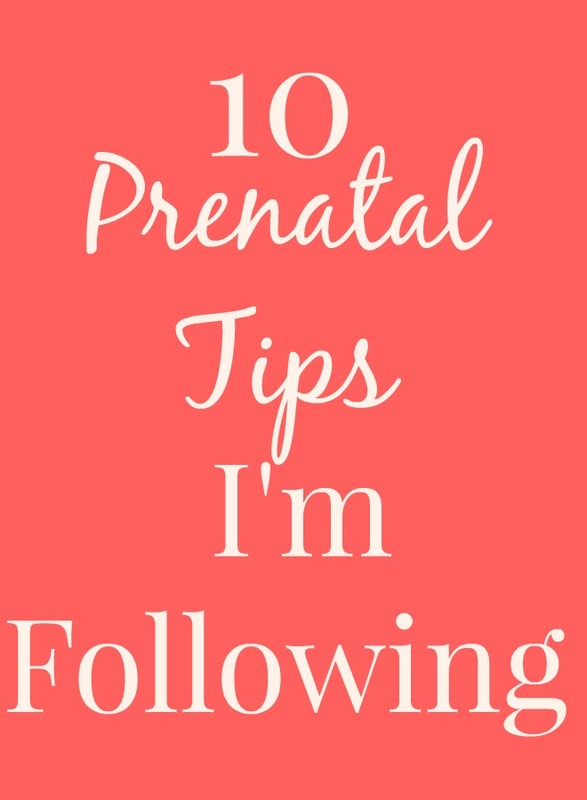 These tips are what are working for me and may change a bit as the pregnancy goes on. I am so excited for Baby Hernandez 2.0 and cannot wait for him/her to be here! I know that Adalyn is going to be an awesome big sister. My mini baby belly at 8 weeks! I eat pretty well but always make sure to take a prenatal vitamin just to ensure that I get the nutrients that I need for the baby. Especially important is folic acid, iron, calcium and more. Studies show that omega-3 fatty acids are important for brain health of the baby and since my daughter is very smart and seems to be advanced, I am doing the same thing with this baby. I like ground flax and chia seeds in my oatmeal for omega-3s and I also take a daily fish oil supplement. Can't hurt, right? I am typically a one-cup of coffee a day kind of girl but right now, I am only having 1 cup of caffeinated tea per day. This is for a couple of reasons: 1. One day early on in my first trimester, coffee just didn't sound good so I skipped it. I've been doing this for awhile and haven't really wanted it yet. 2. I finally realized that in order for me to take a nap, I need to have very limited caffeine. If I drink coffee, I cannot nap but still feel super tired. If I feel like having coffee again during my pregnancy, I will, but for now, I'm enjoying trying different flavors of tea. My strongest tip that I follow during pregnancy is exercising every day. For me, this usually just includes walking but when I do exercise, I feel 1000x better than when I do not. Therefore, it is so important to me. One morning, I skipped my walk and felt nauseous and I was so moody. Therefore, I get up and take my dog on a walk in order to feel my best. It works for me and I hope to do this through the end of my pregnancy, just like last time. I am a person who does not relax. I work 7 days a week between my blog and my job as a dietitian. I get home from work and do more work. Therefore, taking a break and relaxing during my first trimester has been tough. I lucked out that blog work has been a little slow at the end of the summer and therefore, was able to take some time to relax. Before being pregnant, it has been at least a year since I have had a nap. In the last 3 weeks, I have had 4 naps! That is telling me that I am tired and need to relax. I have been so, so hungry this first trimester. I do not count calories but I know that I am eating a lot more than usual. I eat a good sized breakfast around 7 such as overnight oats (whole milk yogurt, oats, chia seeds, flax) topped with almond butter and berries and am starving an hour and a half later. So hungry that I feel sick, lightheaded and weak. Therefore, I have been packing myself two breakfasts at work and eating them both. I trust that if I am hungry, it is for a reason. My body will tell me when I need to eat, even if it is a lot more than usual. I am lucky in that my husband is amazing and has been picking up the slack as I have been super tired during my first trimester. As I said, it is hard for me to relax and I am trying to give myself grace that it is okay that I relax and not work, work, work like crazy. I keep telling myself this: if you are so tired, it is your body telling you to relax. I am trying my best! Produce is so important during pregnancy for fiber, fluid, vitamins and minerals. Pregnant women are prone to constipation and eating enough fiber helps to keep everything regular. During the first trimester, vegetables have not sounded good a lot of times so I just eat what I can, when I can. I trick myself in little ways such as finely dicing up spinach in my food, having a smoothie with spinach or making soup or sloppy joe full of vegetables. Whatever work! I absolutely love my little family of three and I know that things are going to get a little crazy once the baby gets here so we are spending time together and enjoying it. Even though it is my second pregnancy, I am still reading up everything that I can about pregnancy. I love reading the weekly updates of what is going on with the baby. This time around, I forgot which foods you cannot eat when you are pregnant so I had to look that up. Also, I know that there is constantly new research and guidelines for pregnancy so staying up to date is important for the health of my baby. When I was pregnant with Adalyn, I read What to Expect® When You're Expecting and really liked it. I planned to re-read it this time around and am excited to have gotten my hands on the new 5th edition which has up-to-the minute information and advice. I am excited to be reading through it to be up to date and to prepare for baby Hernandez #2! You're totally going to think that this is staged but it isn't! Adalyn can't stop "reading" the book either haha. It is cool because it helps bring Dad into the book throughout which my husband likes and answers every pregnancy question. There is information about Zika virus which is a concern for pregnant women. There is nutrition advice, staying fit info, travel guidelines, mental health information, tips on labor and delivery and more.